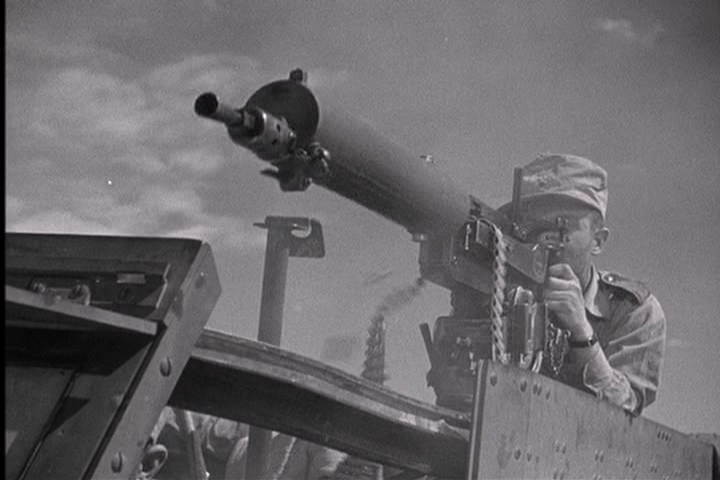 How can you go wrong with Humphrey Bogart in a tank? 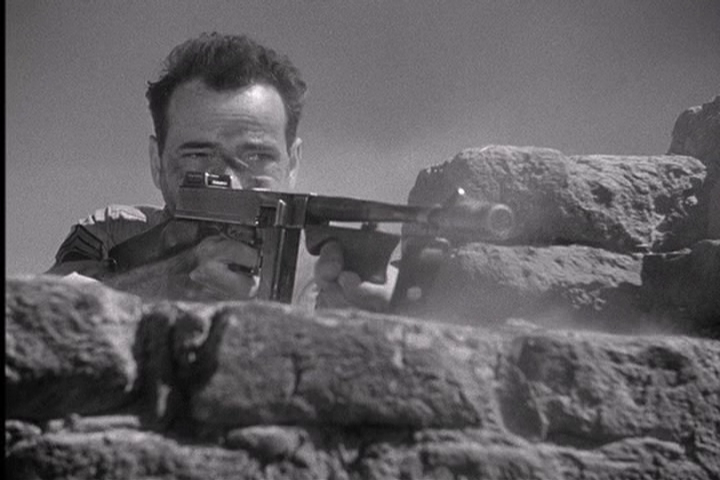 Bogart plays Sergeant Joe Gunn in Sahara, a propaganda film made in 1943. Southern California plays the Sahara desert quite effectively. 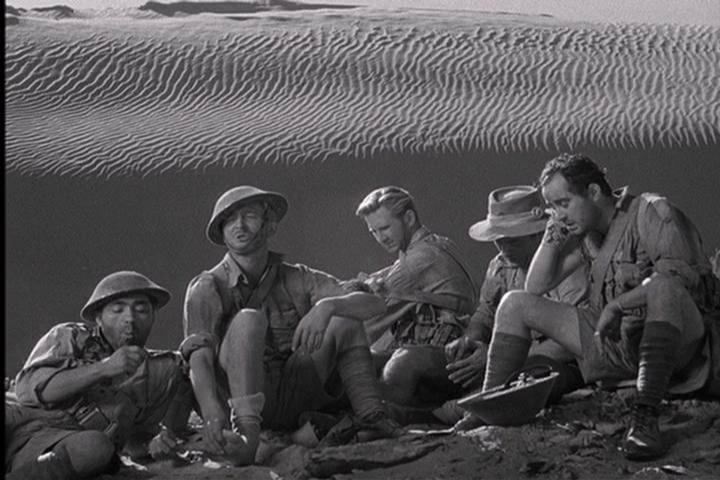 The film begins with Gunn and his crew becoming separated from a British 8th Army retreat, stranding them to their own resourcefulness. They must make their way to safety with little communication and under harassing enemy fire. Along the way, they pick up the remnants of a British medical team, they rescue an Italian (to show how generous the Americans are, for sure… that’s propaganda!) In their quest for safety, water becomes the very important goal. Gunn also picks up others, including a Frenchman and Sudanese man, and they manage to rescue a hostile German pilot who had strafed them moments before. The rag tag collection of friends, allies and enemies learn of a well, rumored to be in an old Roman fort. 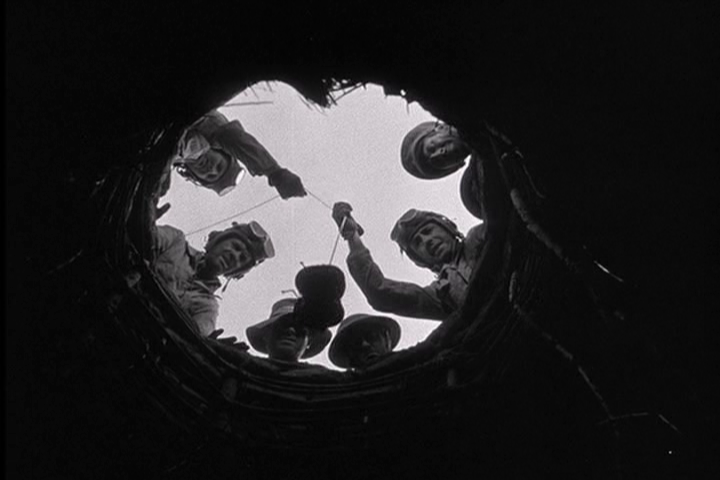 The story takes a turn for the better when the men find the well, and discover the water still drips. It drips painfully slow, but its water. Now the group has a strategic advantage in the parched desert theater. The group digs in, knowing there are hundreds of Germans heading their way, all of them needing water badly. 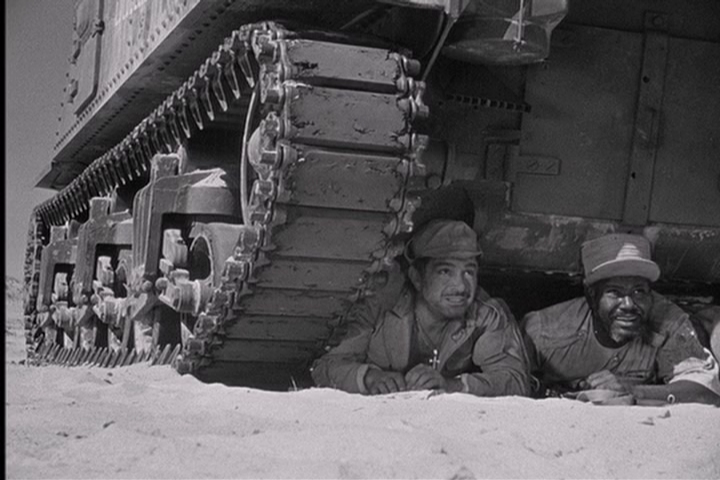 With their faithful M3 Lee tank, “Lulubelle,” on the high ground and camouflaged, the men prepare for conflict. The Germans send a delegate to discuss surrender terms, after all, a ragtag group like this certainly cant beat back the might of Rommel’s Afrika Korps. The German tells Bogart “You can save your life.” Bogart, in his typically tough-guy manner, replies “ You’ve heard my offer. Water for guns.” The German turns and leaves. 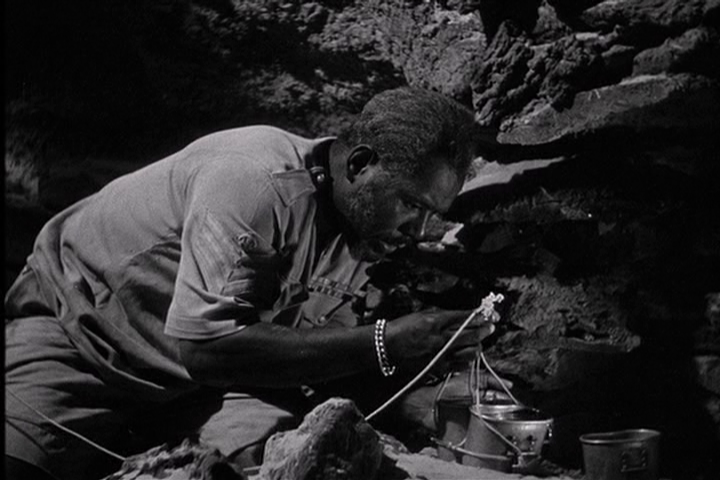 This film is a fairly enjoyable adventure with some pretty good black and white cinematography. Its a clean film, and of course it shows the Americans as the moral goodfellows. Its a hero film, and as such we can’t really ask for more than inspiring leadership and few moral conflicts. Incidentally, there are no women in the film, no sexual situations, very little foul language and its a film that I would show to my young children. Some of the technical effects are rather goofy, as one expects from the period. The German aircraft that strafes the group in their tank is an early, Allison-engined P-51B, but close ups of the aircraft show what looks like a ridiculous paper mache fairing with stubby little machine guns mounted in the fuselage. Ahhh, Hollywood! 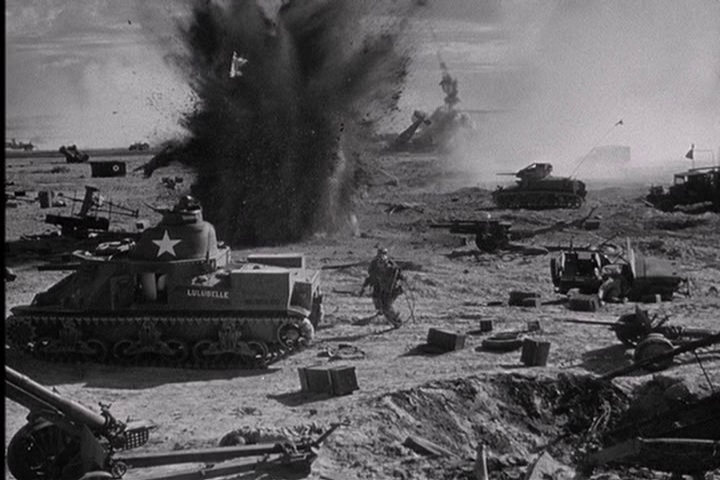 The tank is a legit M3 Lee, and if you enjoy tanks, this film is going to please. 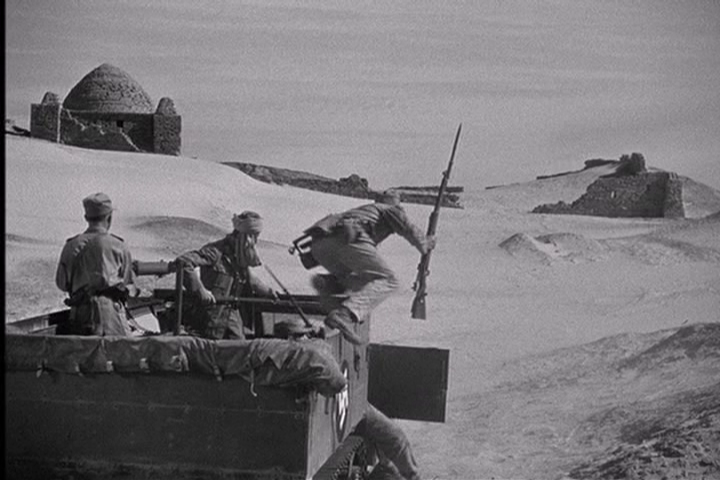 The name “Lulubelle” on an M3 grant made an appearance in Spielberg’s comedy film 1941 as an homage to Sahara. Steven Spielberg would have watched this film on Saturday afternoon TV, like I did. Despite the fact that this film served a propaganda role that elevated the role of the US in WWII to that of a morally superior force while villifying the enemy (just like the Warner brothers and Disney cartoons of the day), the movie is more than just a simple “rah-rah” for the good guys. 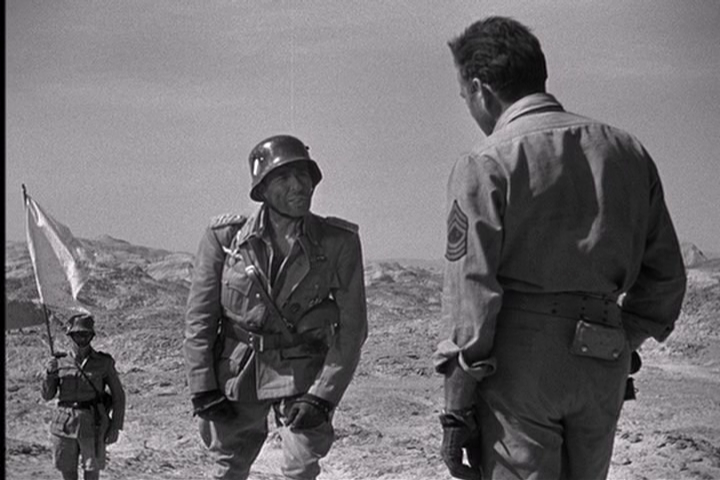 Overall its a good old war movie, and it’s got Humphrey Bogart fighting lots of Germans. Kind of like African Queen without the boat. And the girl. But stilll. Enjoy this film with some popcorn.